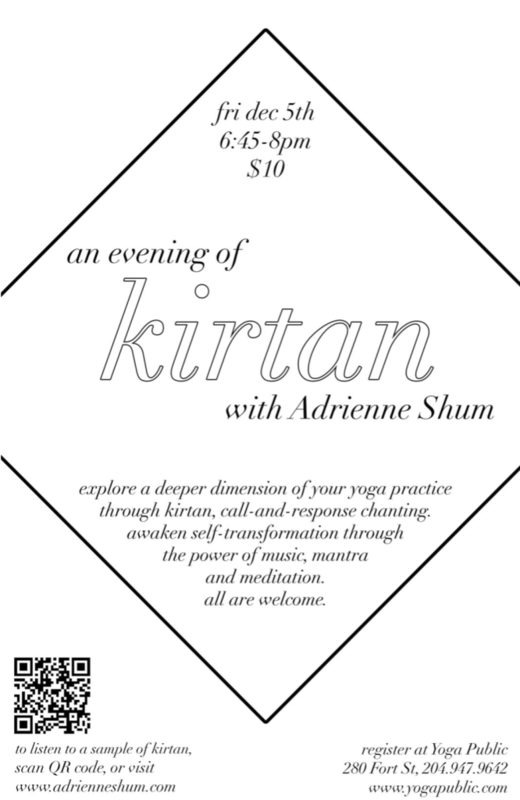 My yoga teacher Jonathan Austman is leading a day of silent practice on Sunday, January 18, 2015, in Winnipeg, Manitoba. There will be guided seated and walking meditation, yoga, and a deliciously Ayurvedic and vegetarian lunch prepared by moi! If you are interested, please send Susan Claire (our lovely administrator and fellow practitioner) an email at: scjohnson43(at)yahoo(dot)com. Space is limited, so consider registering early. I hope you can join us for a contemplative day of study and practice. Winnipeggers, it’s your turn: I hope you can join me at Yoga Public on Friday December 5th, for a lovely evening of music and mantra. As winter begins to reveal its frosty limbs, it is so nice to gather together and build joy and energy. Check this out to hear a sample of Kirtan from our summer events to get you in the mood! Thank you to all that gave their time and energy to the weekend meditation retreat with Jonathan! It was an honour to cook for you all. If you are interested in recipes, I will be posting them (slowly, I warn you) on my food blog (www.twohollowlegs.wordpress.com). I am so pleased to announce that I will be preparing the meals for a silent vipassana weekend retreat with Jonathan Austman at the Sandy-Saulteaux Spiritual Centre in Beausejour, Manitoba, October 3-5, 2014! I am really looking forward to cooking nourishing and calming food for our students as they endeavour to deepen their practice. Registration and more details to come soon!